The road less traveled is a book that can literally change your life. Published in 1978, this book was written by a psychiatrist M. Scott Peck who had finally come to recognize what people needed in order to be happy. It became his best-known work and literally catapulted him to success. In short, this is a book which clearly describes what makes up a fulfilled human being. ‘The road less traveled’ begins with the very simple and yet most profound truth “Life is difficult!” The author explains that we must first accept this fact in order to make things easier. In life, we can either moan about our problems or we can solve them. It is here that the author leads us into the importance of discipline in solving problems. 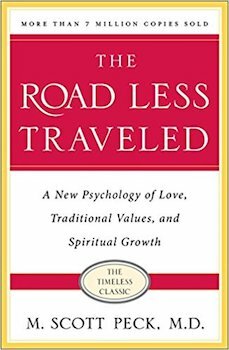 In ‘The road less traveled’, M. Scott Peck defines discipline as the basic set of tools we need to solve life’s problems. These tools are the disciplines of delaying gratification, assuming responsibility, dedicating to the truth, and balancing our lives. Most of us do not want to wrestle with our problems because of the pain involved. Yet, it is only in grappling with our problems that life has its meaning and which brings about happiness. In the second section, Peck talks about the nature of love, which he considers the driving force behind spiritual growth. He attacks a misconception about love and says the idea of romantic love doesn’t really exist. He considers romantic love to be a very destructive myth and explains that ‘true’ love is effort. His perspective on love is that love is not a feeling but an activity and an investment. Love is “The will to extend one’s self for the purpose of nurturing one’s own or another’s spiritual growth.” Love is primarily actions towards nurturing the spiritual growth of another. It is not a feeling. It consists of what you do for another person. The final section of this life-changing book describes the concept of Grace. This is the powerful force that comes from outside human consciousness and nurtures spiritual growth in human beings. It is through the pursuit of love and through Grace that we eventually learn to live happily and ‘The road less traveled’ is the straight solution to that goal. This is a book which is highly recommended and which will certainly change your life for the better.